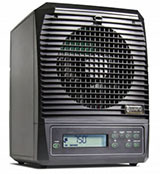 pureAir 3000 Air Purifier by GreenTech Environmental. Enhanced air flow, filtration, and ionization result in never before experienced performance. Modernized lines and a smaller frame bring an attractive appliance to your living space. Improved display design and setting memory escalate user experience. 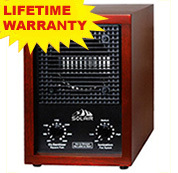 Enjoy the latest advancements in Whole Home Air Purifiers with pureAir 3000 by GreenTech Environmental. Unlike filter machines and air purifier products that use only one or two technologies, the pureAir 3000 incorporates four separate technologies to significantly reduce or entirely eliminate odors, smoke, pollen, dust, dust mites, pet dander, mold, carbon monoxide, bacteria, viruses, volatile organic compounds (VOC’s - Chemical Gases) and other unhealthy and potentially dangerous indoor contaminates; even those long embedded in walls, ceilings, floors, carpers, furniture, and clothing. 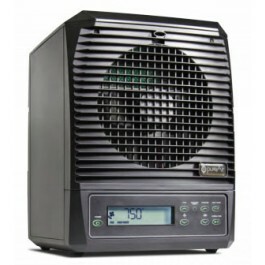 The PCO technology in pureAir 3000 not only destroys biological contaminants caught inside the cell, it also produces a purifying plasma which breaks down odors, Volatile Organic Compounds (VOCs), mold, bacteria, and viruses through molecular disassociation, resulting in trace carbon dioxide and water vapor. Needlepoint and pulse wave ionization create a continuous high level of ions in the treated space which cause particles in the air to become attracted to each other like magnets. As particles clump together, they are too heavy to remain suspended in the air and fall to the floor or are caught in filtration. Activated Oxygen, or Ozone, is a naturally occurring oxidizer found everywhere outdoors, with higher levels after thunderstorms. It breaks down chemicals and microbials and is especially adept at eliminating offensive odors. pureAir 3000’s oxidation generator is completely scalable and when adjusted based upon the area being purified generates an effective yet low level of ozone considered safe and natural. An advanced electro-static filter is included with pureAir 3000 to help keep the purifier clean as well as filter out particles clumped together through ionization. 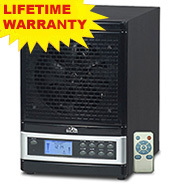 Unlike expensive HEPA filters, the electro-static filter is washable and can be used for the lifetime of the pureAir 3000.